Are you looking to get a low cost effective office solution? Telsec can set you up in an instant office solution within minutes. With the high cost of infrastructure, your company wants an office solution that fits your budget and still delivers high value customer service to your clients. Your office is part of the image you project to your clients. Our professional staff greet your clients (whether on the phone or at the reception) with a professional attitude and project a professional image for your company. Your organization will also benefit from the use of normal office services, as and when you need them without long term commitments or leases. The Telsec fully managed executive office suite centre boasts a range of support facilities, including free meeting rooms and boardrooms for tenant use. See the above photo of Telsec’s Seminar Training Room which accommodates up to 50 people in theatre mode and 30 people in classroom mode. Click on seminar training room for additional information and pricing. Our fully furnished offices includes amenities such as high speed broadband, digital phone service and personalized call answering. Our office business centre also offers a well appointed kitchen with complimentary coffee and tea for you and your clients. 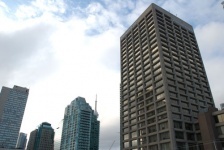 Our downtown Toronto offices are conveniently located close to rapid transit and major arterial roads.